There are two ways of configuring linked server in SSMS. One way is by using sp_addlinkedserver system stored procedure and another is by using SQL Server Management Studio (SSMS) GUI interface. In this article will be explained how to configure a linked server using a SQL Server data source. More information about other data sources can be found on this link. If the SQL Server type is chosen to configure a SQL Server linked server, the name specified in the Linked server text box must be the name of the remote SQL Server. If a SQL Server instance is default instance, type the name of the computer that hosts the instance of SQL Server (e.g. WSERVER2012). If the SQL Server is a named instance, type the name of the computer and the name of the instance separated by slash (e.g. WSERVER2012\SQLEXPRESS). Here, different ways to authenticate the linked server can be set. 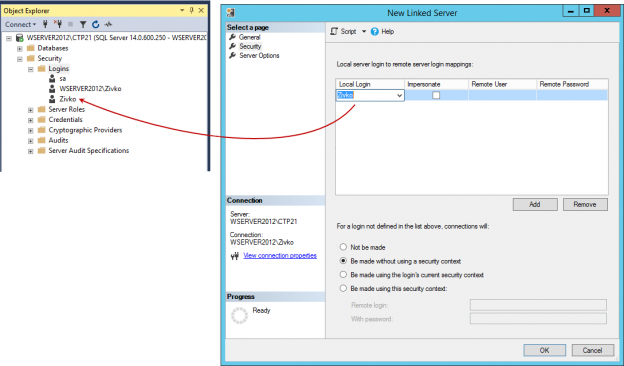 Under the Local server login to remote server login mappings, two ways of local logging to a remote login can be set. One way is to associate a local login with a remote login and other way is to impersonate. The login mappings should either be impersonate or have a remote login name. This happens because the Impersonate check box isn’t checked. For Windows logins, the login must be a valid login on the linked server. In order to use impersonation, the delegation between the local server and the linked server must be set. The remote user option allows users from the local SQL server to connect to the linked SQL server even though their credentials aren’t present on the remote server by using the credentials from the user that exists on the remote server. Basically, it allows local logins to connect to a remote server as a different login that must exist on a remote server. Specify the password of the remote user. If this radio button is chosen, any users that aren’t identified in the Local server login to remote server login mappings list cannot establish connection to the linked server. The Be made without using a security context option is used for connecting to data sources that do not require any authentication, for example like a text file. When this option is selected for connect to a linked server, will have the same effect as selecting the “Not be made” option. OLE DB provider “SQLNCLI11” for linked server “WSERVER2012\SQLEXPRESS” returned message “Invalid authorization specification”. The OLE DB provider “SQLNCLI11” for linked server “WSERVER2012\SQLEXPRESS” reported an error. Authentication failed. Cannot initialize the data source object of OLE DB provider “SQLNCLI11” for linked server “WSERVER2012\SQLEXPRESS”. Login failed for user ‘Ben’. Here, additional options for linked server can be seen or set. The first option is the Collation Compatible option. This option is used to identify if the linked server has the same collation as the local server. This option should set to True only if is known that the linked server has the same collation as the local, otherwise it should be set to False (default). This RCP (Remote Procedure Call) is used to enable the access to remote procedures to be called from the linked server or to be called to the linked server. Server ‘WSERVER2012\SQLEXPRESS’ is not configured for RPC. When this option is set to True, the collection of remote columns will be used and collection specified in the Collation Name filed will be used for data source that are not SQL Server data source, but if the option is set to False then the collation for the local server will be used. By default, is set to False. If the Use Remote Collation filed set to True, this option is used to specify the collation name of the linked server for the data source that is not SQL Server data source. When chose a collation name, it must be a collation that SQL Server supports. This option is used to set the maximum time the local server should wait for to get a connection to the linked server SQL Server instance. If 0 (zero) is set, then the server option remote login timeout is used. By default, 10 second is set for this option. Note, the default value for SQL Server 2008 is 20 seconds. This option is used to set how long, in seconds, a remote process can take before time is out. The default value is 600 second (10 minutes). To disable query timeout put 0 (zero) in this field and the query will wait until it is completed. In this option, it can be specified whether the linked server is participating in replication as a distribution Publisher. In this option, it can be set whether the linked server to be a replication publisher or not. If True, the linked server is a publisher. Otherwise, is not. The Publisher is a database instance, that makes data available to other locations through replication. In this option, it can be specified whether the linked server is a replication subscriber or not. A Subscriber is a database instance, that receives replicated data. More information about Distributor, Publisher, Subscriber can be found on the Replication Publishing Model Overview page. This option checks schema changes that have occurred since compilation in the remote tables. If this option is set to False (default state), SQL Server checks changes before the execution of a query and if there are some changes, it recompiles the query. If the Lazy schema validation is set to True, an SQL Server delay schema checks the remote tables until query execution. This option is used to protect the actions of a server-to-server procedure through a Microsoft Distributed Transaction Coordinator (MS DTC) transaction. If this option is set to True calling a remote stored procedure starts a distributed transaction and enlists the transaction with MS DTC. Now, when everything is set, click the OK button on the New Linked Server dialog. A newly created linked server will appear under the Linked Server folder. If everything goes well the linked server will be removed from the Linked Servers folder.